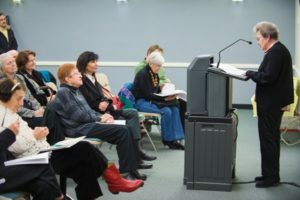 Ms. Fininis is one of twelve senior citizens in the Inprint Senior Memoir Workshop at the Evelyn Rubenstein Jewish Community Center of Houston (JCC). This Sunday, December 10th, the workshop will celebrate an anthology of the work by participants in the 2015-2017 workshops, with a reading at 2:00 pm. The event will take place at the Inprint House on 1520 Main Street, and is free and open to the public. It’s a great chance to hear from the rich, diverse histories of these amazing writers.